I realize I'm slacking on my book list for the year. That doesn't mean I haven't been reading though, I'm always reading through magazines, blogs, cookbooks and children's books of course; but life got a little busy and I sort of fell behind on my reading list. Recently I've gotten back into the habit of taking the kids to the library for weekly visits. I was so happy when I spotted this book on the shelf there because it's one on my list and a book that I've been dying to read! Even with my hectic schedule I seriously was reading this at any spare moment given. I actually finished most of it during our trip to Omaha, several hours riding in a car makes for some good reading time. I've heard lots of people say be prepared for tears and have Kleenex by you. While I wasn't exactly crying, there were moments where I definitely had tears in my eyes. Katie takes you through her world in Uganda and what sort of living conditions these children are in. It literally makes you sick! We have it so good here in the United States and I don't think we stop to think about how others around the world have to work so much more for so little. I really don't want to spoil the book for those wishing to read it because it's really that good, so I'll try to give a brief recap. Katie is your typical high schooler living in Tennessee, she comes from a well-off family and pretty much has the perfect life. She decides to follow God's calling and winds up taking a short missions trip to Uganda over her Christmas break with her mother. After spending a few weeks there helping to care for babies she returns home. However, she can't get those precious children out of head and wants more, wants to do more good and decides to listen to God's calling on her life. Her parents reluctantly let her go back to Uganda under the condition that she returns to the U.S. after 1 year to start her college education. During that year Katie is able to do so much good in Uganda. She starts off as a kindergarten teacher and quickly realizes there is a great need to help provide these families with assistance so they can send their children to school. Not only are they not able to afford basic school supplies, many families have a hard time feeding their families from day to day. It's hard to imagine that $20 to us can feed a family in Uganda for a couple months. Katie ends up finding a home to live in Uganda where she takes care of more than 100 children everyday. From feeding them meals, giving them baths, clean clothes and necessary medical treatment and just loving each and every one of them. One by one she adopts 14 children, loving each child with all of her heart. She tells of her days, days filled with some much that I can't even imagine she can accomplish all she does. She truly does this all for the grace of God and it's such an inspiring and amazing story! After reading her book, I believe you'll be itching to go out and do something worthwhile; whether it's volunteering at a nearby shelter, children's hospital or simply just loving on your own kids a little more. I know I have a different outlook on life now. 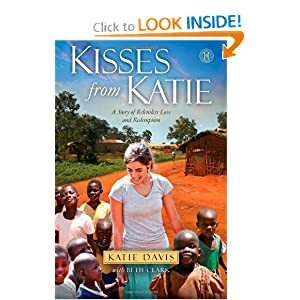 If you'd like to follow more of Katie's story and all of her Ugandan children, you can check out her blog: Kisses from Katie.